Composting begins by wetting straw and dehydrated poultry manure (aka DPW) and stacking these raw materials into rectangular piles with tight sides and loose centers. Water is sprayed as these materials move through a compost turner. Nitrogen supplements and gypsum are spread and thoroughly mixed. Once the pile is wetted and formed, aerobic fermentation (composting) commences resulting in a food source best suited for the growth of mushrooms. Supplements such as gypsum (used to increase flocculation) and DPW (used to provide nitrogen) are added periodically as the compost pile is aerated and moves through the turner. Step 1 composting lasts about 21-28 days. Once the compost is ready, the next step is to pasteurize it. Pasteurization is necessary to kill any pests or fungi that may be present in the compost as well as to remove the ammonia, which formed during Step 1. 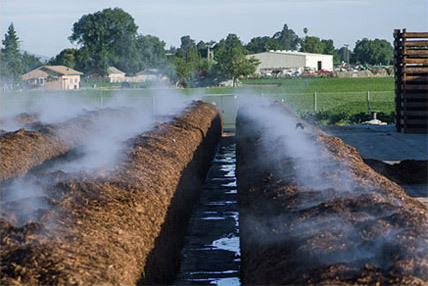 Once the compost is pasteurized, the temperature is lowered to approximately 90°F at which point spawning can begin. Mushrooms reproduce by means of microscopic spores that form within the cap. They are so tiny you can't see them individually with the naked eye. Because the spores don't contain chlorophyll to begin germinating as seeds do, they rely on their compost for nourishment. When germination begins, a mass of interwoven, single-cell wide structures is produced known as hyphae. Collectively, masses of hyphae are known as the mycelium, which are the white, thread-like structures we see at the inception of mushroom development. 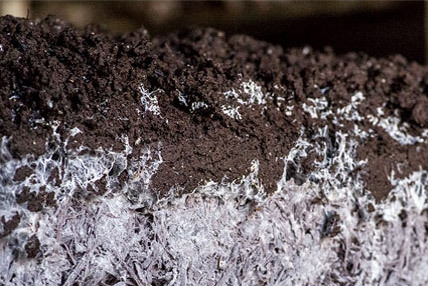 Mycelium can be propagated vegetatively, meaning new organisms arise without production of spores, similar to separating bulbs and getting more plants. 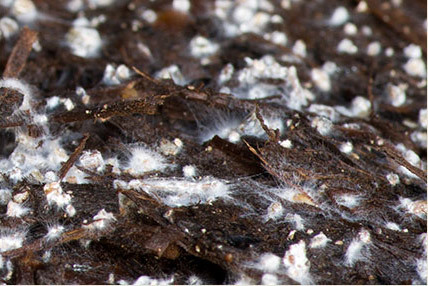 Mycelium propagated vegetatively is known as spawn. Spawn is distributed and then thoroughly mixed into the compost. A complete spawn run usually requires 14 to 21 days. 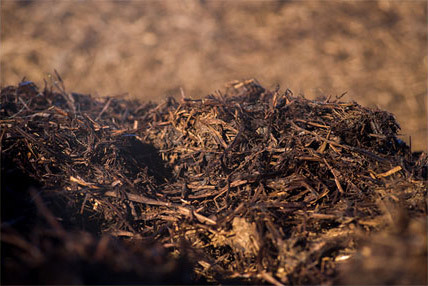 Casing, a mixture of peat moss with ground limestone or sugar beet lime (called clay-loam field soil), is a top-dressing applied to the spawn-run compost. Mushrooms will eventually form on top of the casing. The casing acts as a water reservoir and a place where rhizomorphs form. Rhizomorphs look like thick strings and form when the very fine mycelium fuses together. Mushroom initials, primordia or “pins,” eventually form on the rhizomorphs. Throughout the period following casing, water must be applied intermittently to raise the moisture level before the mushroom pins form. Knowing when, how, and how much water to apply to casing is considered an art. Initials are extremely small but can be seen as outgrowths on a rhizomorph. Once an initial quadruples in size, the structure is a called a “pin.” Pins continue to expand and grow larger through the button stage, and ultimately a button enlarges to a mushroom. 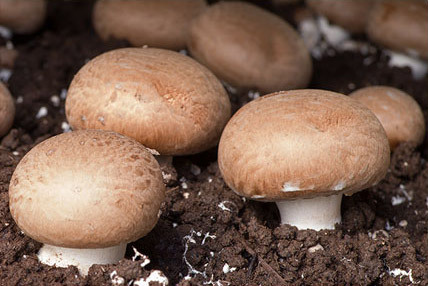 Harvestable mushrooms appear 16 to 18 days after casing. Pins develop when the carbon dioxide content of room air is lowered to 800 ppm or lower (depending on the cultivar) by introducing fresh air into the growing room. The timing of fresh air introduction is very important and is something learned only through experience. Pinning affects both the potential yield and quality of a crop and is therefore a significant step in the production cycle. 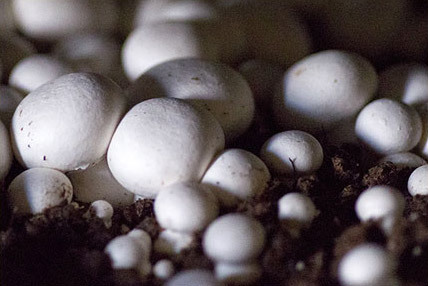 Global Mushrooms’ generates less pins as the company’s goal is to grow higher quality mushrooms. Break is the term used to describe the repeating 3-to-5-day harvest periods during a cropping cycle - always followed by a few days when no mushrooms are available to harvest. This cycle repeats itself in a rhythmic fashion due to an interesting aspect of mushroom growing: when mature mushrooms are picked, an inhibitor to mushroom development is removed, which encourages the next flush to move toward maturity. For this reason, harvesting can go on as long as mushrooms continue to mature in significant quantity and frequency, usually for about 21 days. In creating an ideal environment for cropping, proper ventilation is essential; it is also necessary to carefully control air temperature, humidity and water. Once the last flush of mushrooms has been picked, the growing room is closed off and the room is pasteurized with steam. The cycle begins anew.